Looking for some affordable and healthy foods to add to your diet? Enjoy this New 7 Part Series on some of the best frugal foods to keep your body and finances fit! Brown rice provides a very cheap source of complex carbohydrates and fiber that is a versatile addition to many meals. It must be cooked a little longer than more traditional white rice but making the switch is a huge upgrade. Brown rice will not cause the large spike in blood sugar that its white counterpart will and instead provides a long steady blood sugar level. Brown rice is only slightly more expensive and harder to find than white rice but the extra pennies you pay will pay off huge healthy dividends. Some people complain that they don’t like the flavor or texture as much as white rice but I promise you will get used to it. More and more people and restaurants are finally starting to break tradition to make the switch to brown rice for health reasons. This plant source of complete proteins is good first thing in the morning or post-workout because it is quickly broken down and absorbed by the body. Soy also has healthy fats, no cholesterol, and provides heart healthy flavenoids that reduce cholesterol levels. Soybeans are very versatile and quite affordable complete proteins that everyone can enjoy regardless of meat-eating status. Common forms of soy include edamame and tofu. Soy milk is also a high-quality nutritional product but it is significantly more expensive than skim milk. There is a myth that consuming soy products will raise estrogen levels in men but that has been proven to be false. Soy protein in any form is safe and healthy to consume for men and women alike. Broccoli provides excellent sources of fiber, water, and powerful antioxidants. The more broccoli and other green cruciferous vegetables, that you consume, the better shape your immune and digestive systems will be in and the easier it will be to lose weight. The fiber content in broccoli helps to fill you up with minimal calories. Broccoli goes great with pasta, chicken, and many other healthy frugal meals so it should be easy to get in several servings per week. Try to add it to your dinners or snack on them with hummus throughout the day. Blueberries have long been touted as having large amounts of powerful antioxidants. They are also excellent sources of water and fiber. In my opinion, blueberries are best eaten with breakfast or post-workout so that the simple carbohydrates are immediately utilized by the body. They go great blended up in protein smoothies. There is also nothing wrong with having some as a snack in between meals as long as you don’t eat a whole container at once. Sometimes they are not the cheapest fruit out there, especially when they aren’t in season, but they are usually affordable enough to consume on a consistent basis along with other fruits. This makes the list for the same reasons as tomatoes. Watermelon has some simple sugars as does any fruit but that is outweighed greatly by its water, fiber, and antioxidant content. It has such a high percentage of water content that the calorie content is very small. 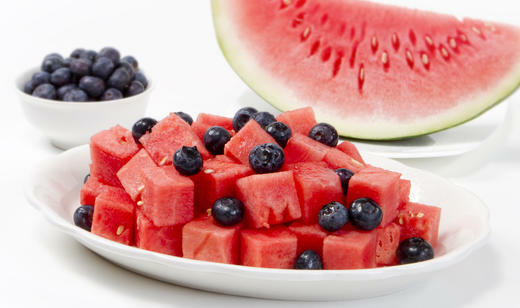 Watermelon has plenty of Lycopene content just like tomatoes and is a lot more refreshing on a hot summer day. You can buy a half or whole watermelon pretty cheaply which will provide plenty of food for you and your guests. More Fantastic Frugal Fitness Food Coming Soon!